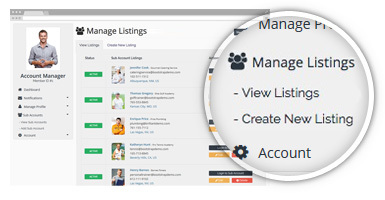 The Multi-Member Manager add-on allows individual members to manage multiple listings from one master account. The main account holder can quickly create, edit, and switch between multiple business listings. Perfect for websites that list banks, restaurant chains, retail stores, real estate firms, and more! Any additional listing that are created will be the same membership level of the main account holder. Additional listings will also have the same privileges as the main account holder. The only difference is that these newly created listings can not create additional listings themselves – only the main account holder can create additional listings. EXAMPLE 1: A business might have multiple locations or branches around the country. 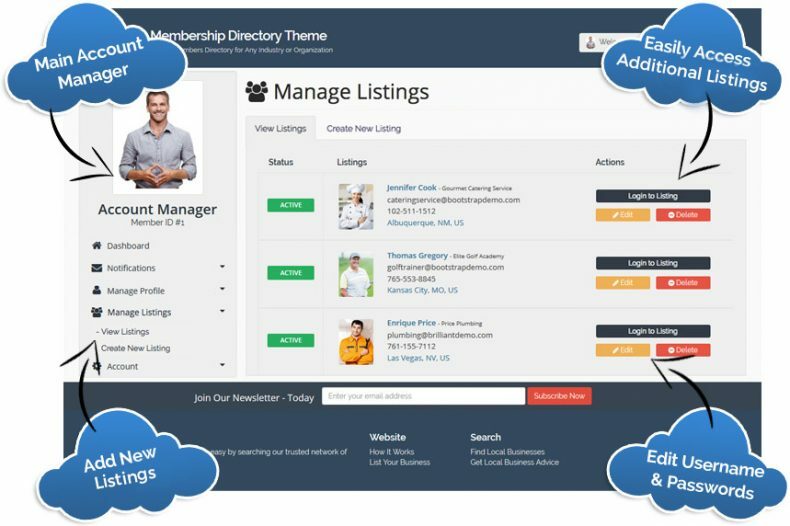 Using the Multi-Member Manager add-on, the main account manager can publish individual business listings for each of the locations – all with unique addresses, phone numbers, and other important information that is unique to each location. EXAMPLE 2: Talent or modeling agencies using the Multi-Member Manager add-on can easily setup individual profiles for each of their clients, such as bands, actors, models, etc. Each profile is unique and searchable on your website. The main account manager can easily navigate between these listings to update profile photos and other details within each listing. EXAMPLE 3: One of your members might be a large company with many employees. As the main account manager, they can setup individual employee listings for each of their staff members. For example, a real estate firm can set up individual profiles for each of their agents that service different geographical locations. Each agent will then have their own unique listing with their own login username and password. These listings can be found in the directory based on their geographical location.